An early foray into Thoroughbred racing spoiled breeder and owner Mike Anderson. The second horse purchased at auction by the 60-year-old Illinois car dealership owner developed into stakes winner Emily Ring. He bought the daughter of Fit to Fight at the 1999 Keeneland September sale for $20,000 with the help of bloodstock adviser Cecil Seaman and named the filly after his mother Bernice Emily Ring Anderson and his grandmother Emily Ring. “I thought the sound of ‘Emily Ring’ coming down the stretch sounded better than ‘Bernice Anderson,’ ” Anderson joked. Emily Ring was a flat-out speed demon that won three stakes, two of them gate to wire, between Dec. 7, 2002, and Feb. 8, 2003. She placed in three other stakes during a racing career that spanned five seasons from 2 to 6. Emily Ring is now his sole broodmare and living at Jim FitzGerald’s Knockgriffin Farm near Paris, Ky. She has produced six foals of racing age, all bred by Anderson, including graded stakes winner Upgrade, who won the Jaipur Stakes (gr. IIIT) June 8 at Belmont Park. The Jaipur was the 5-year-old gelded son of Saint Liam’s second start in stakes company. His first, the Ft. Marcy Stakes (gr. IIIT) May 5 at Belmont, was run over soft turf, which wasn’t to his liking. Anderson had sold Upgrade as a yearling for $170,000 to agent Ben Glass, who purchased the horse for Gary and Mary West. The gelding has changed hands a couple of times since the Wests bought him and is now owned by Dennis Narlinger and trained by Michelle Nihei. After Upgrade crossed the wire in the Jaipur, Anderson’s phone started ringing with congratulations and offers to buy Emily Ring. He’s not selling, however. “Emily Ring was a real diamond in the rough,” said Anderson, who is racing a Bluegrass Cat half brother to Upgrade named Bluegrass Dan. The 3-year-old gelding, being trained by Wayne Catalano, broke his maiden by 43?4 lengths June 2 in wire-to-wire fashion at Arlington Park. Anderson has two other fillies in training. One is an Empire Maker named Lady Micaela, who has not started, and the other is an Awesome Again named Awesome Gisel, who was the first 2-year-old he ever bought at auction. He acquired Awesome Gisel for $110,000 during the 2011 Ocala Breeders’ Sales Co.’s March sale because a homebred colt out of Emily Ring got injured and was unable to race. That left an empty spot in his stable. Because Anderson was already in Florida on a golfing trip at the time, he went to Ocala to shop. Anderson does not have a lifelong love affair with Thoroughbred racing. His introduction to the sport came in 2006 through his ex-wife, Kim, and her father and part-time trainer Dave Reid. After he got a taste of the action, Anderson was all in. Anderson was so committed early on that he bought a house with 50 acres, thinking he would keep broodmares on the property. 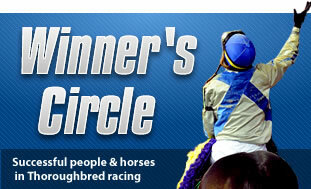 All of Anderson’s young horses now are broken and trained by Bill Recio in Ocala. When they are ready to race, they go to Catalano. At auction and with mating decisions, Anderson relies on FitzGerald and James Keogh.